What makes a community member? Followers are different from community members. Followers click “like” every now and then. Sometimes they retweet. Occasionally they click on links. Community members, on the other hand, frequently comment. They share on a daily basis. They consistently contribute to the discussion. Followers and community members behave very differently, but why? What makes a community member from a follower? 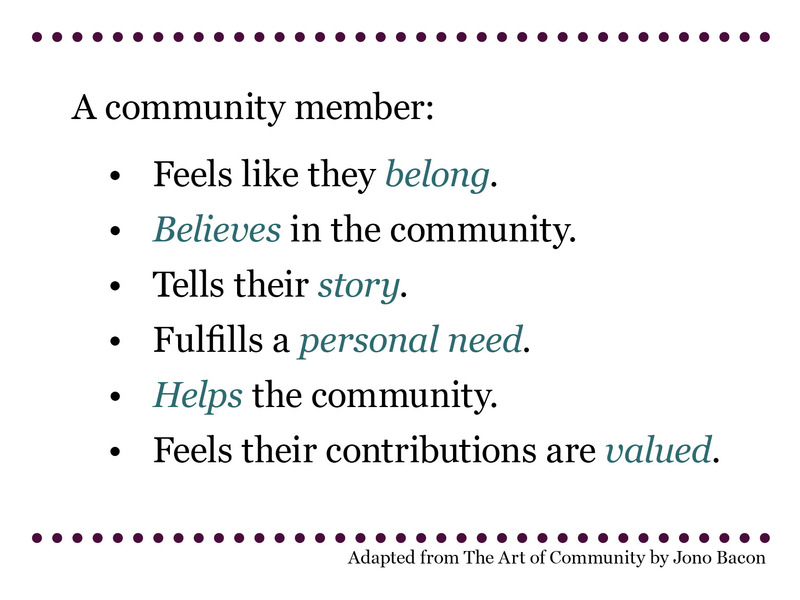 In The Art of Community by Jono Bacon (free download here), the author spells out in great detail what makes a community member. As a fresh community manager, I created a Coles Notes (or tl;dr) version of what he said as a constant reminder of what experiences I need to facilitate among the community members. These are important points to keep in mind for anyone who is charged with growing a fanbase or a following. When you can fulfill these needs, you’ll find that it’s much easier to sell your cause (of course, the challenge instead is in facilitating the fulfillment of these needs). I highly recommend reading Jono’s book to any aspiring community managers out there. There is tremendous insight on nearly every page, and you will refer back to it time and time again. Thanks to Rich Millington of Fever Bee and The Pillar Summit for recommending Jono’s book. Is there a trait or experience missing? Please leave a comment! It’s sort of touched upon/implied, but I think something about being engaged with the community is a big one. An online community I was part of for years fell apart because there was no engagement anymore – we just added each other to Facebook instead… Still no engagement. Good point. Spelling it out would certainly help, instead of just leaving it as implied. Speaking from my own experience, I still identify myself as a member of my old online stomping ground, even though I haven’t been active on it for 5 or so years. I’m still friends with everyone, though as in your case, we don’t really talk. That sort of leaves me in community member limbo; not quite a community member, but more than a follower. @lexiphanic also has a neat whitepaper here called Defining Community: http://bit.ly/N7XRwu (disclaimer he works with me). I think the only thing missing is probably a “strong common interest” although it’s implied in the first two. Glad to hear you enjoyed the Pillar Summit – I’m the instructor for the Australian course. You’re right that “strong common interest” is implied, but it never hurts to spell it out. Perhaps a revision is in order. As for The Pillar Summit, I wish I could take more. It was great brain food that has positively influenced my approach to community management.